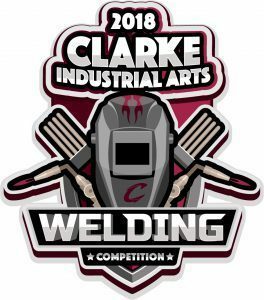 In cooperation with Clarke County Development Corporation, local manufacturers will be working with Clarke Industrial Arts students to create works of art for the first annual Welding Art Sculpture Event. Starting October 5, teams of 2-3 students will begin meeting with a welding mentor from one of Osceola’s manufacturers. Twice a week through October, the teams will design, plan, and create an original work of art from available scraps and materials made available to the students and their mentor. The final competition will be held on October 26, from 10:00 am – 3:00 pm. The pieces will be judged by the Arts Council and a local welding expert based on their creativity, craftsmanship and welding skill. The winning piece will be displayed at the business of the winning team’s mentor. All pieces created by the students and their mentors will be displayed at the annual Osceola Chamber Main Street / Clarke County Development Corporation Annual dinner held in January. Finally, each original art piece will be mounted on an appropriate base provided by Salford, and the displayed along the Osceola trails system. For more information about the competition, contact Bill Trickey at 641-414-1884 or David Lyden, Clarke Schools Industrial Arts teacher, at 641-342-6505.